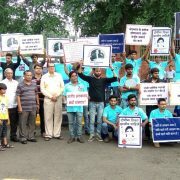 The tyrannical social system of caste is creating a major disturbance in the society and community. Human dignity is being trampled ruthlessly every day. The Tribal communities as well who are the heart and soul of our civilizational heritage are being dDalitsisplaced in the guise of development to serve the vested interests of the dominants. 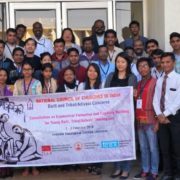 In such a time as this the National Council of Churches in India – Dalit and Tribal/Adivasi Concerns reaffirms the divine praxis of liberation of human beings from the clutches of all dehumanizing forces at work so as to achieve authentic humanization ensuring each individual self-respect and dignity in the midst of systemic evils and structures which threaten the very existence of all lives on this planet. The intrinsic value of the entire cosmos needs to be reclaimed. 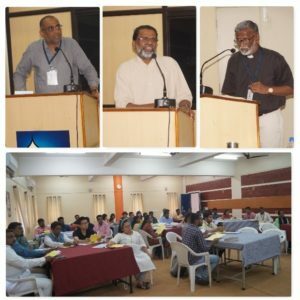 These concerns were the subsistence of the consultation organized by the Dalit and Tribal/Adivasi Concerns of National Council of Churches in India on “Ecumenical Formation and Capacity Building for Young Dalit, Tribal/Adivasi Theologians” from 11-13 February 2019 at the Henry Martyn Institute, Hyderabad. The consultation bore witness to 39 delegates and 17 resource persons. 15 Theological Colleges affiliated to Senate of Serampore delegated their students for the consultation. 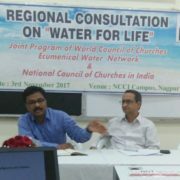 The consultation brought in a wide spectrum of perspectives from the contributions of church leaders, theologians, social workers, and social activists through their experiences and ideologies under which they were mold to contemplate on the issues faced by the people living in the margins. The sessions included a wide array on the perspectives of Ecumenism, issues related to people living in the margins, and intriguing Bible studies relooking the Biblical texts and narratives through the context of people in the margins. This was yet again a time to reform, revolutionize and challenge certain approaches made to understand the realities of the people living in the margins, and also explicate fresh ideas and awareness about the social atrocities done on the subaltern groups. The consultation came out as a meaningful eye opener for a majority of participants as they pledge to become change makers in the near future who could passionately contribute in bringing a great change in the larger community applying the ideas and information they acquired in this process. The consultation was a great success potentiating all the participants towards a synergic cause.